Buy Fresh O Green Tea - Lemon Green Tea, Ginger Green Tea, Elachi Gree Tea, Mint Green Tea. 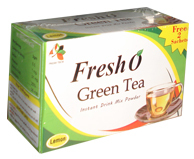 Fresh Tech India - Fresh O Green Tea Instant Drink Mix Powder - 100% Natural, Rich Antioxidant With Low Calorie Sweetner. Ice Tea : Mix 1 pack with 120ml of cool water and ice cubes and stir well.